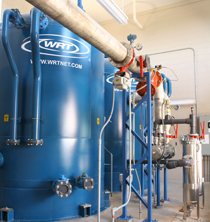 WRT provides cost-efficient water treatment processes and proprietary treatment media for the removal of radium, uranium, and other select contaminants from drinking water. WRT currently has over 175 full-scale systems in operation in 19 states and has conducted over 100 pilot studies nationwide for the removal of radium and uranium. We also hold radioactive materials licensing for operation in 203 states, allowing us to handle, remove and safely dispose of radioactive treatment residuals. WRT’s treatment processes represent the most efficient and environmentally progressive solutions in the industry for meeting regulatory compliance standards. View radium removal solutions here. View uranium removal solutions here. Need contaminant removal not listed here? Contact us to discuss your unique situation.